Crayfish Pasta, originally uploaded by Camemberu. Some days you are just not fussy about food and anything goes. 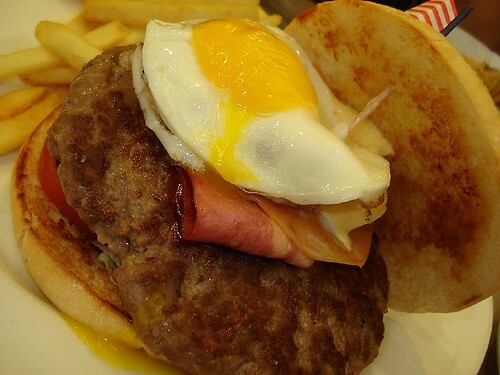 We heard Swensen's had introduced 27 new items to its menu, so didn't mind taking a look. I'm not familiar with the old menu anyway, so not sure which dishes are new. 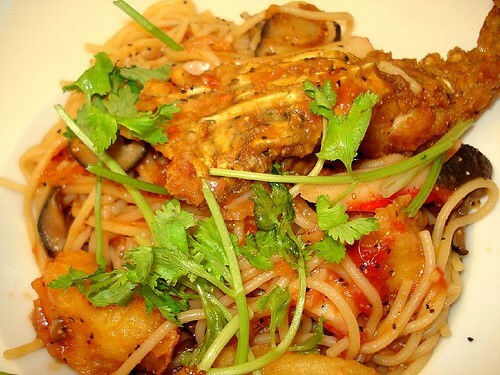 Crayfish pasta is probably one of the old menu items, highlighted as "favourite" under the pasta section. The pasta came piping hot, but the battered crayfish halves felt a bit cold. Clearly pre-fried and just tossed in at the end. I didn't think much of the dish, as the flavours were not prominent enough for me. Hubby thought the pasta was okay, and helped me finish it. Mega-Burger, originally uploaded by Camemberu. Burgers - one of hubby's favourite comfort food. Unfortunately this Mega Burger was a mega letdown. The patty tasted floury and soggy, and did not have any of the succulent, seared beefy aroma like the Texas Burger at Seah Street Deli did. I liked the fries though. 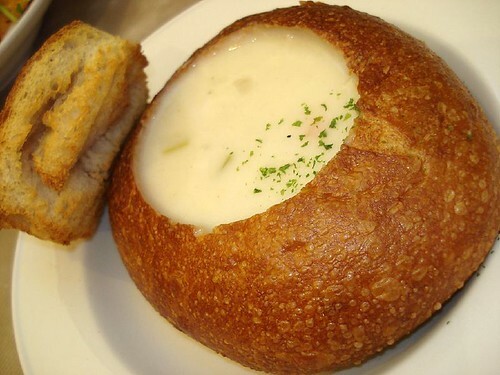 Clam Chowder in Sourdough Bun, originally uploaded by Camemberu. I knew this soup would not be stellar here, but I was just craving clam chowder. They served it in a fairly large sourdough boule, nicely blistered on the skin. The carved-out top was well-toasted, like a giant crouton. Went well with the soup (which indeed was average but pepper and salt helped revive some flavour). I quite enjoyed the bread bowl, crisp on the outside and chewy inside. Ocean Crunch Salad, originally uploaded by Camemberu. This item is probably new on the menu. 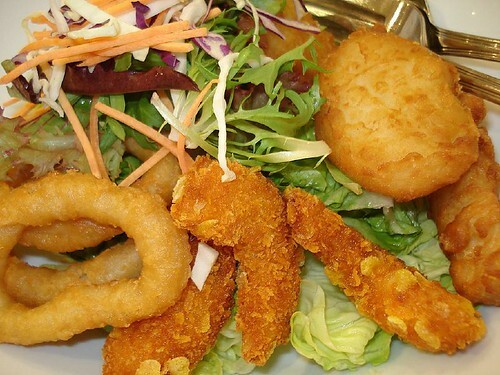 A huge serving of crisp greens topped with calamari, breaded shrimp and battered fish pieces came in one of those semi chi-chi sloping bowls. Salad dressing was some pineapple-tinged mayo, which strangely looked very orangey but was not unpleasant. 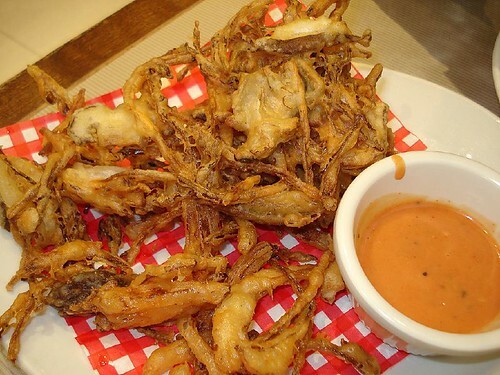 Vegetable kakiage-like thingy, originally uploaded by Camemberu. Forgot the name of this thing, but it was like vegetable kakiage. Slices of cabbage, carrot, mushrooms and onions (I think), fried to death but tasting deliciously crunchy. Some bits a bit burnt but I didn't mind. Same orange dip as the salad above. Not a very healthy meal but it kept us well-fed for a while. But like I said, Swensen's is really more for times when you really aren't fussy. The desserts are probably the joint's strong suit (I remember a good apple crumble in a hot skillet). I used to work in Swensens as a cook when i was waiting for my poly. I swear OFF Swensens ever since. My personal take - I find once the restaurant turns halal, their food quality pummeled. Pizza Hut, KFC, Swensens are simply INEDIBLE! hmm.. i went to swensen not long ago, also based on the promise of the 27 new menu items. But boy was i disappointed. Swensens standard is not up there anymore, give me another place anyday. Osaka - More Than Just Takoyaki? Katsukura - Holy Grail of All Tonkatsu!